As I reflect on the impact consistently practicing yoga has had on me (beyond physical strength) in the last year, I realize it's taught me a ton about myself and balancing my work with life. Today I'm excited to share these insights with you in the hopes they'll bring new perspective to your own journey in life and business. 1. Your work doesn't define your worth. Objectively you know this to be true, but it's also amazingly easy to forget. So many of us immerse ourselves in our work to the point where we don't know which end is up. Especially on days when I'm struggling to find my creative stride or when I receive some challenging client feedback, it's particularly tough to fend off negative self talk and feelings of unworthiness. This is when I really need yoga. There's something tremendously freeing about not only the practice itself, but also just getting out of the office (and my overwhelmed headspace) and putting my whole heart and all my effort into something totally different for a while. Just like in an airplane when you take off, the world suddenly falls away, and all your daily struggles somehow seem small and silly and much more manageable. That's what yoga does for me. It gives me perspective and the reminder that work is just one facet of my life. It doesn't define me or my worth, and a “bad” work day feels significantly less so after really stepping away and focussing on something else. Takeaway: Your work doesn't define you, nor does one client's feedback or an arbitrary amount of followers. It may not be yoga for you, but do some exploring to find your own release—especially for when the stress sets in. The act of stepping away and putting your whole heart into something else will do wonders to clear your head and to remind you that work is just work and a bad day is just one day. 2. You are perfectly imperfect. One of the philosophies of yoga that I adore is that we're all flawed and unique and beautiful. Your body and mind and experience aren't quite like anyone else's, and there's a whole infinite matrix of qualities that make you you. The point isn't to compare yourself to anyone else. This is your own personal journey and you can only do the best that you can do. Some days I can't go as far or accomplish as much as I did yesterday, and that's okay. We each have our own experience, our own strengths, and our own opportunity areas where we can grow. What matters is that you show up, you try, and you're kind to yourself. Once you accept that you're doing the best you can, you're free to enjoy the journey. Takeaway: Be kind to yourself. You may not accomplish every single thing on your to-do list today. Some days you might not check off anything on your list, but that doesn't make you any less of a wonderful worthy person. Stop wasting your precious time and energy belittling and comparing yourself to everyone else. Take pride in doing the best you can do today. 3. You're exactly where you need to be. For a society with all the answers at our fingertips, it's ironic how stressed, busy, and preoccupied we manage to always be. I don't know about you, but I find it incredibly difficult to just relax without my mind starting to stack all the things I “should” be doing on top of me. Some days it feels like I'm suffocating under the weight of them. Take pride in doing the best you can do today. Yoga to the rescue yet again! When you begin a yoga session, the first thing you're encouraged to do is to let go. Let go of all the places you think you “should” be and the things you “should” be doing. Clear your mind, and just be. Be here. Be now. Bask in the present. Know that you're exactly where you need to be, doing exactly what you need to do. Takeaway: Take care to not let yourself get stuck regretting the past or fearing the future. Remove the pressure of all those “shoulds” and take it one precious moment at a time. Embrace the present and know that you're exactly where you're meant to be. Just breathe, and be. 4. Yes, you do have the time. We're all busy. It's easy to let everything else come before yourself. I've had plenty of days where I tell myself I don't have time for yoga—I've just got too much to do. Do you know what happens on those days? I struggle to focus and end up wasting hours procrastinating. I don't stand up and stretch enough and my lower back starts acting up. I spend the rest of the day grumpy and in pain, usually accomplishing less than I would have if I had just taken that time for myself and gone. Takeaway: Make yourself a priority. You may feel like you don't have the time, but you do. You will always have responsibilities and others who need you, but if you don't take care of yourself you won't be strong or whole enough to really help anyone. 5. Don't try to do it alone. I've written before about the tough parts of being self-employed. The most difficult one for me has been the loneliness and isolation of working by myself. While the lack of distractions is great, not seeing other humans on a daily basis can drive you nuts pretty quickly. Thankfully, yoga provides an outlet for me to get up, get out, and see other people. I love the sense of community that yoga fosters, and I'm so grateful for the amazing folks I've met over the last year. All of us are from different walks of life, but as we support each other, we also grow together through this beautiful practice. Takeaway: Get out and around other humans. Find the folks that you can support, that will support you right back. Grow and learn together. Share your experiences. We're not meant to do this alone. Not only has yoga made me stronger, it's transformed the way I see the world and live my life. This particular practice may not be for you, but I encourage you to do some exploring and find your own outlet that will allow you to let go, immerse yourself in something different, grow, and build your own community. 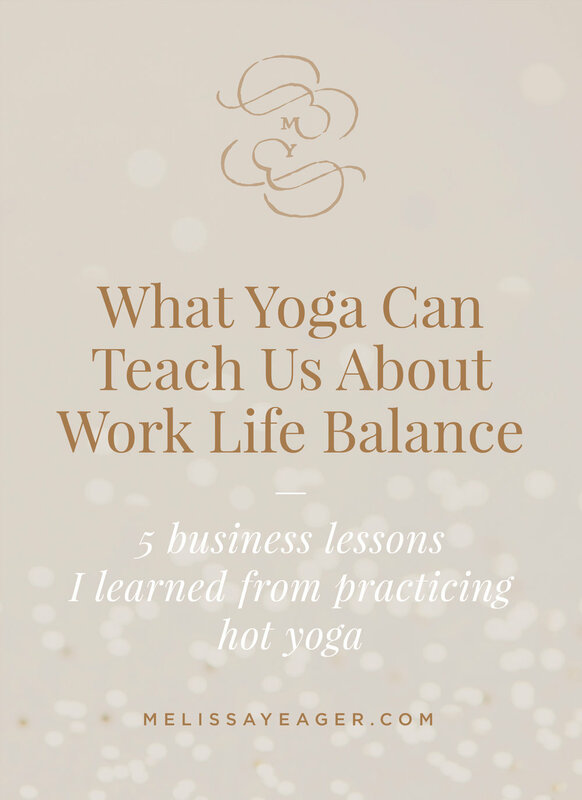 I hope these insights bring some light to your workweek and fresh perspective to the balance of work and play in your own life. Looking back on my own life so far, it's not the deadlines and to-do's and struggles that I remember. It's the experiences and the joy and the love. So why not make these our focus to begin with? Every moment of this journey is precious, and it would be a shame to waste any of it. Now go out and conquer your day knowing you're exactly where you need to be.